Yes, the coolant crossover as it's otherwise known. There have been a few write ups regarding this, but here's mine specific to the VLX600. The procedure is similar to that of the VT750 except on those you have to remove the seat and fuel tank to gain access to the clip for removing the steering covers. My advice? Shut up and do it. Now of course, you do any of this at your own risk and agree to not hold me liable for any of the advice/procedure following. If you notice any omissions or errors, please speak up! Yes? Good. Since first start-up of my VLX after putting the engine back in I've had an ever so small coolant leak ... and by leak I mean drip. Well it nagged me to the point of finally getting around to it. 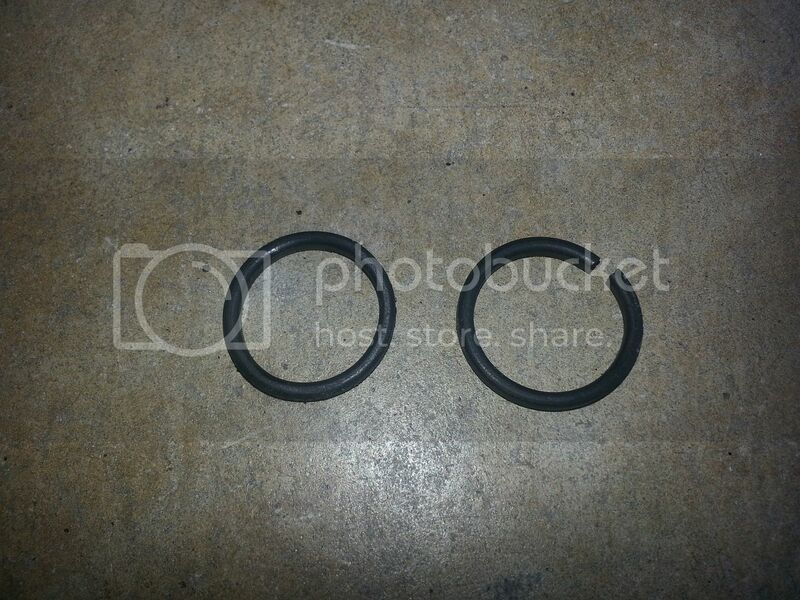 I actually bought the fresh o-rings last year, haha. 1. Be sure engine is off and cool. 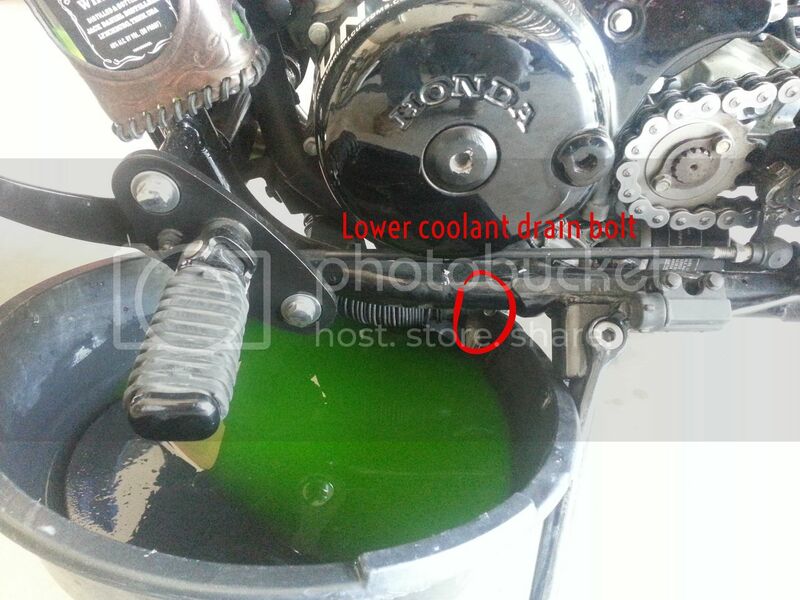 Do NOT work with hot coolant! Duh! 2. Secure bike on side stand in a clean working area. 3. Remove the steering covers (plastic neck covers) to gain access to the radiator cap (my bike does not have covers). Using the Phillips head screwdriver, loosen the screw and pull the covers from the grommets in the frame. 4. 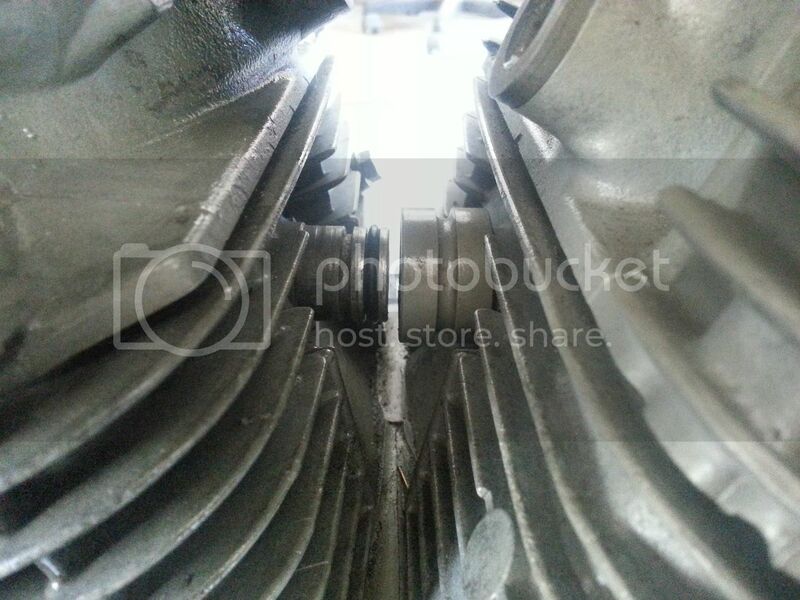 Remove the radiator cap. 5. 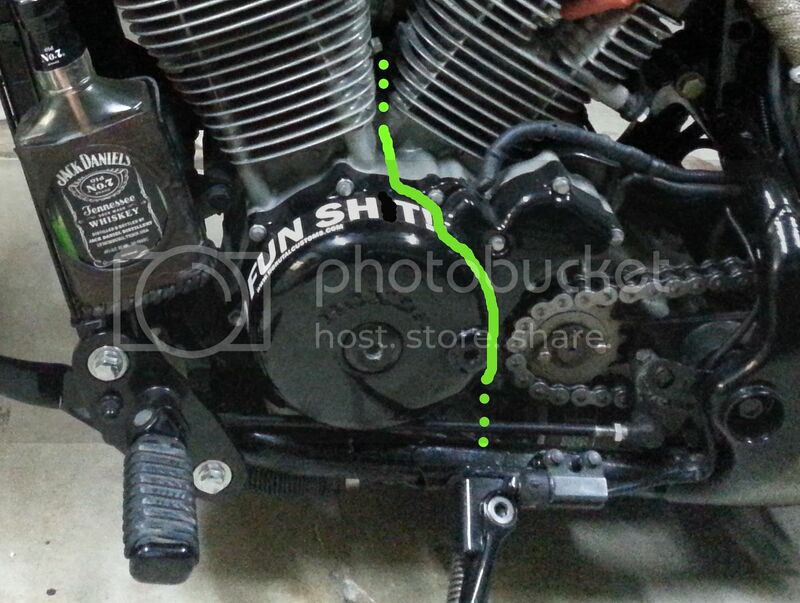 Position catch pan under the left side of the bike (facing forward) directly under the water pump. 6. 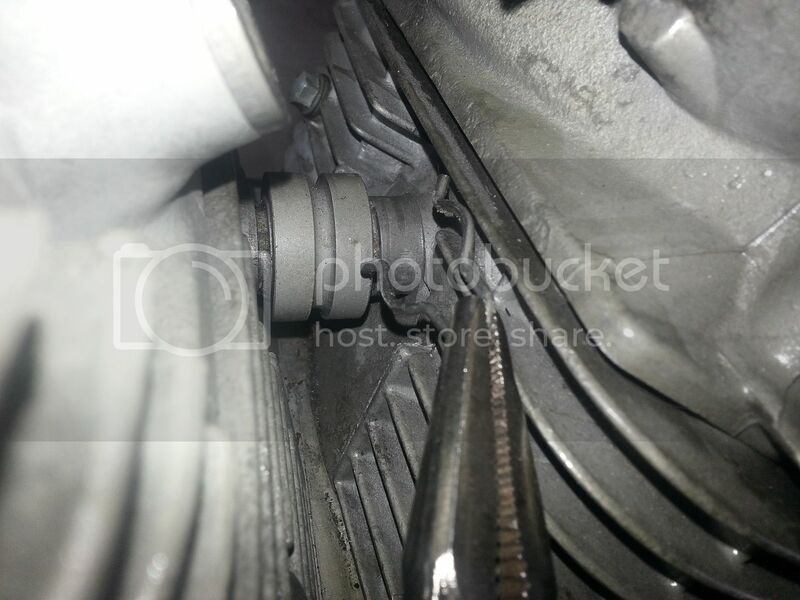 Using the 10mm socket (and extension if needed) loosen and remove the drain bolt (lower bolt facing outward) on the water pump to drain the coolant into the catch pan. 7 Re-install the bolt with it's sealing washer, ensuring it's tight, but do not over tighten! 8. 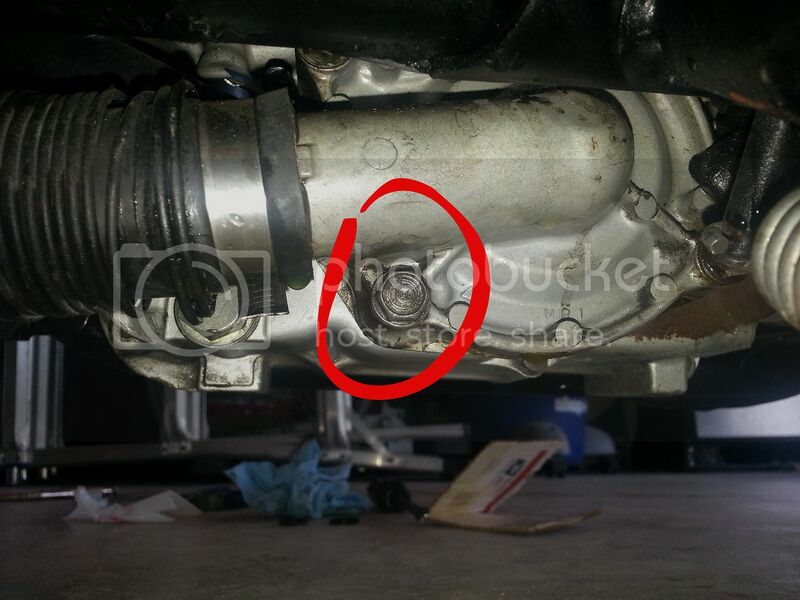 Place a shop rag or towel on top of the starter directly under the rear cylinder coolant drain bolt. 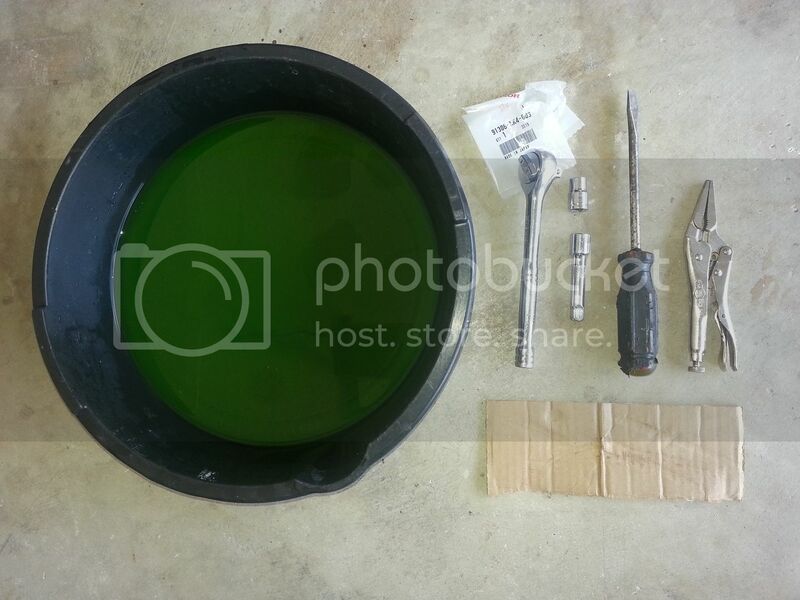 If you want, devise a small funnel to direct the coolant out and into the pan. It IS an awkward area. However, not much fluid will come out, so the rag/towel should suffice. 9. 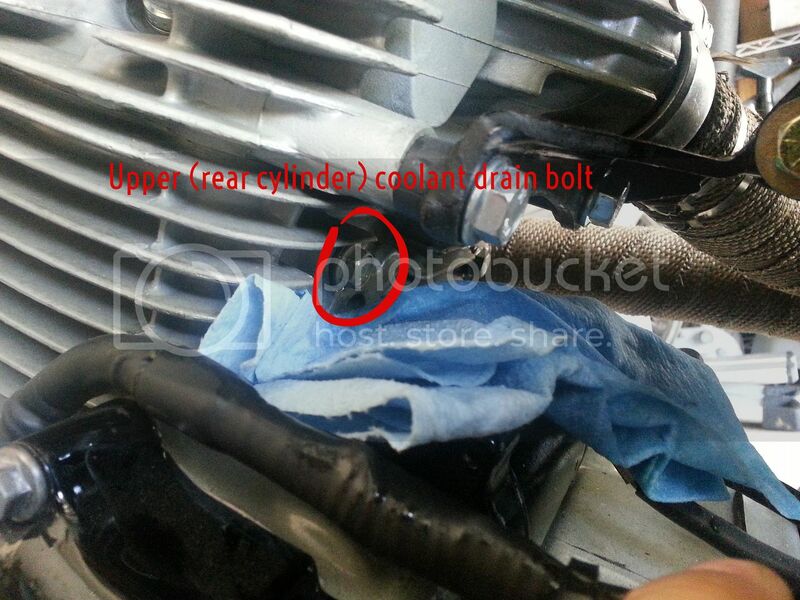 Using the 10mm socket (and extension if needed) loosen and remove the drain bolt. 10. Re-install&nbsp;the bolt with it's sealing washer, ensuring it's tight, but do not over tighten! 11. At the water joint there are two retaining clip rings on either side of the cross-over. Using the needle nose pliers/vice grips, pull up/outward on each clip to disengage from the joint. 12. Place the cardboard on one side of the cylinder and using the flat head screwdriver pry the water joint to one side. It will slide on the cross-overs allowing access to the o-rings. 13. Using the needle nose pliers/vice grips, pinch the old o-ring and either slide it off each cross-over or simply tug on it until it snaps and pull it off. 14. Repeat steps 12-13 for the other o-ring removal. 15. Clean the cross-overs with a brass wire brush or even a toothbrush if needed. 16. Coat one of the new o-rings with fresh coolant and install onto one of the cross-overs ensuing it is seated in the grove completely. It's easy to use one hand to hold the o-ring between your thumb and pointer finger and straddle your other arm over the top of the bike to use your other hand to help seat the o-ring. It was a hard pic to take, thus none. But you get it right? If not, ask. 17. Again, place the cardboard on one side of the cylinder and using the flat head screwdriver pry the water joint to one side, this time covering the new o-ring just installed. 18. Repeat steps 15-16 to install the other new o-ring. 19. Move the water-joint back to the middle again using the cardboard and flat head screwdriver to cover both new o-rings. 20. Re-install the clip rings simply by pressing them into place on their respective grooves. 1. Place a funnel into the radiator cap opening. 2. Pour in the recommended amount of 50/50 coolant or your existing coolant previously drained until it reaches the top of the neck. I found it much easier to first insert the funnel into a soda bottle and pour the coolant from the catch pan into the bottle. 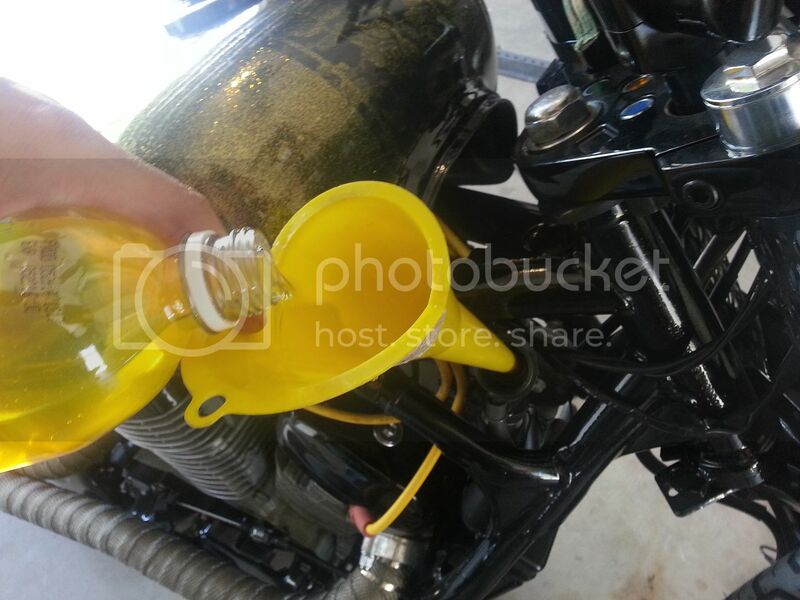 Then insert the funnel into the radiator cap opening on the bike and pour from the bottle. 3. Leaving the radiator cap off, start and run the bike for 2-3 minutes at idle. 4. At 3 minutes, blip the throttle a good 3-4 times to help bleed out any air bubbles. 5. 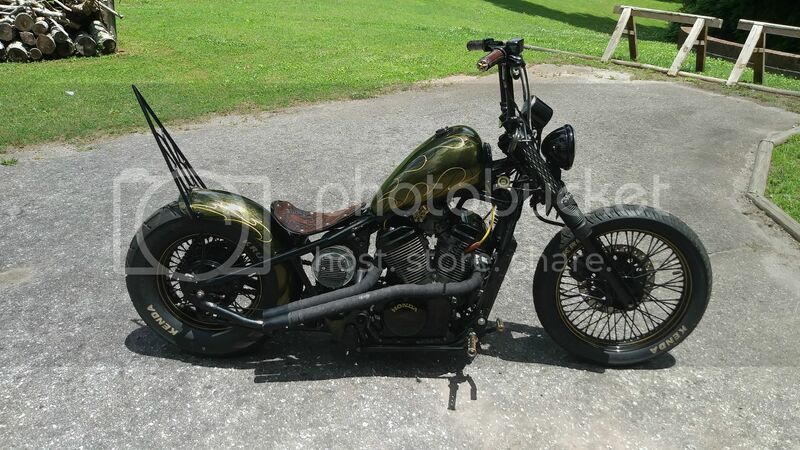 Shut off the bike. 6. Pour in more coolant until it reaches the top of the neck. 7. Re-install the radiator cap. 8. Check for leaks; you're good to go! Last edited by Aced It; 07-06-2014 at 04:13 PM. Hey thank you for this very good write up on this procedure. Photos are a big help as well. Although I had a slight leak while storing my bike for the winter but never knew where it came from. It doesn't leak a single drop throughout the summer. I park it in the same spot everyday. So If I have another leak this winter, I will have a look at this. 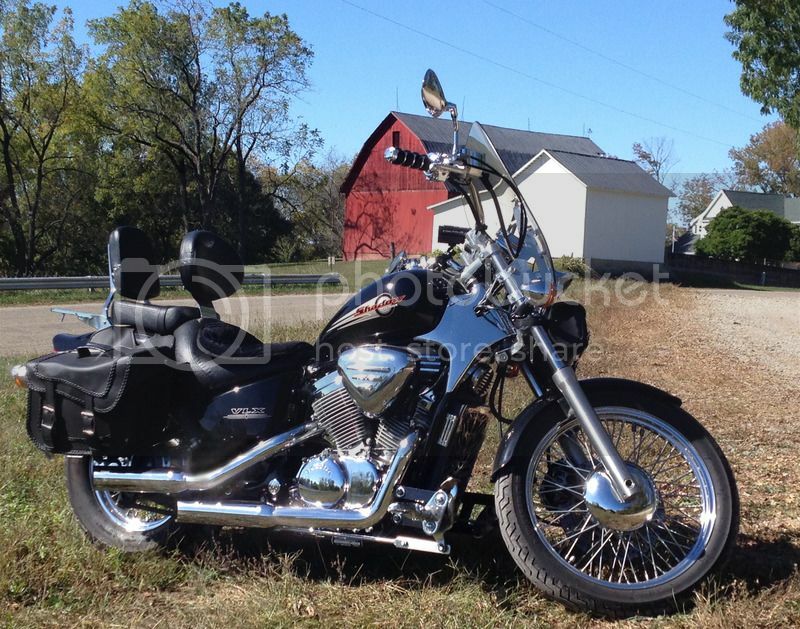 2002 Honda Shadow VLX 600 Deluxe - Lost but not forgotten. 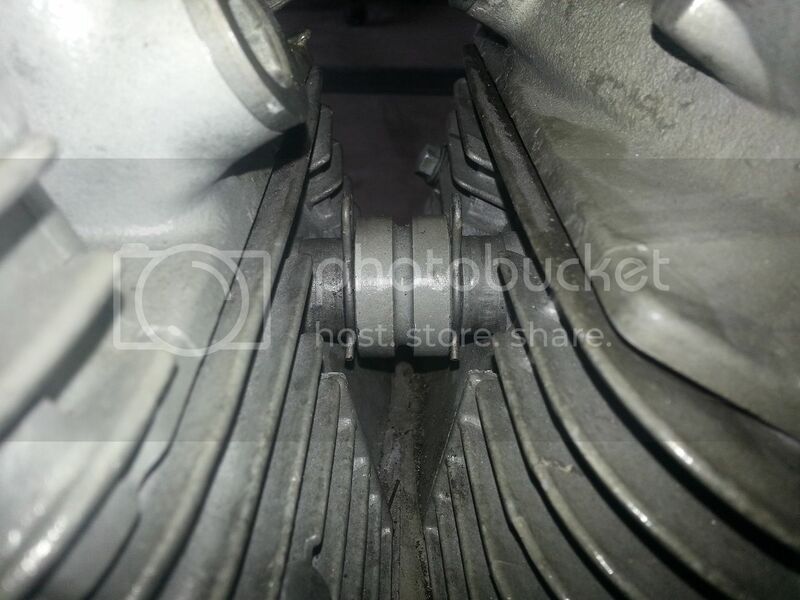 Because the engine is off, the water pump is not moving coolant and the fluid is now stagnant and able to seep more easily through failing o-rings. When the bike is parked on it's stand it leans to the left. 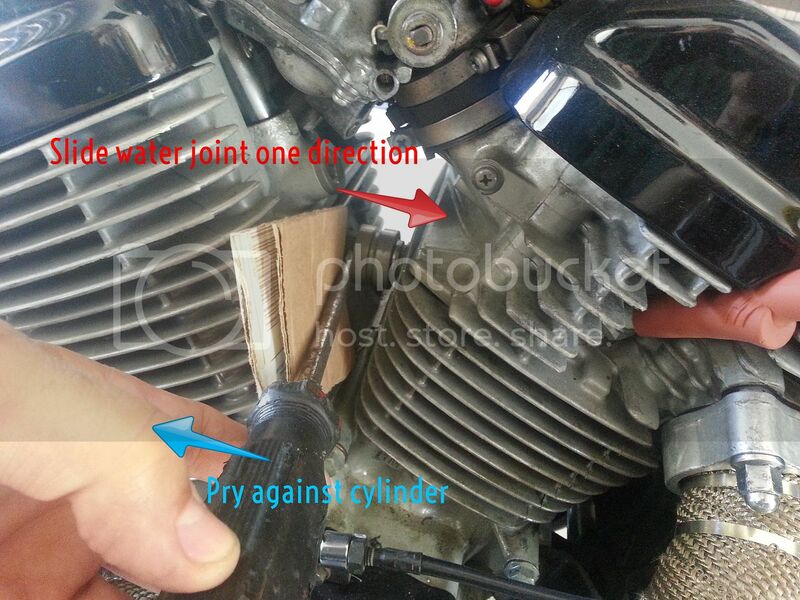 Coolant dripping from the water joint will land in the "jug valley" and naturally run off to the left side. Excellent tutorial on the repair. I have just one question. What step involves the Jack Daniels. That is what I need to know. Ha Ha Ha. Keeps you calm during the process. Thanks, did this to a friend's 750 today and was a big help. I just replaced both O-rings and clips on the cross-over water pipe this weekend and it took no more than 20 minutes with 2 people. Great write up and thank you for sharing! Up next, I have a leaky rear (verticle) water pipe next to the carb boot, will be replacing its seal next weekend. If anyone knows a short cut like this for that too, I'm all ears!